Victoria’s head and neck undraped facing left. The hair is bound with a double ribbon, and gathered behind in a kont with a long loose curl hanging down. The engraver’s initials W.W. (William Wyon) are raised, and are located below the neck. 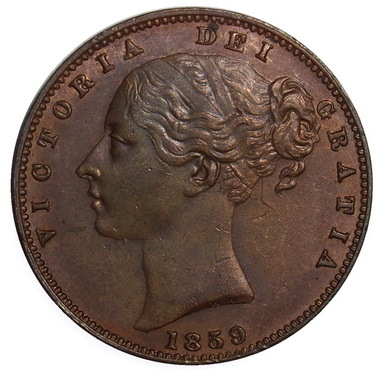 The legend which reads “VICTORIA DEI GRATIA:” almost encircles the bust The legend is an abbreviated translation of “Victoria by the Grace of God” The date is below the bust in numerals. The border consists of teeth, and the teeth sit inside a narrow raised rim. 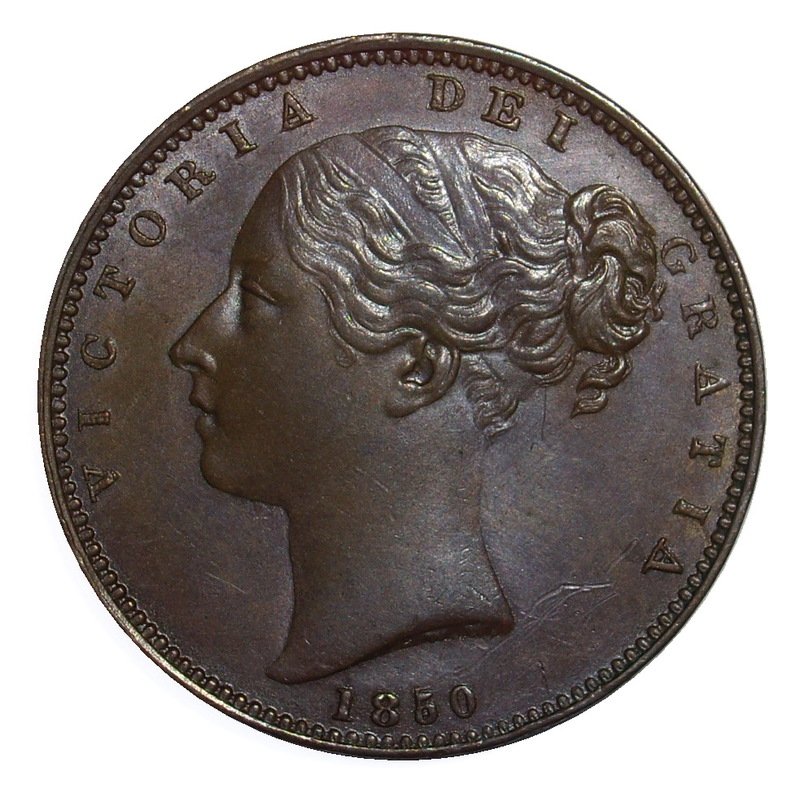 Reworked design as Obverse 1, Victoria’s head and neck undraped facing left. The head is now slightly larger and repositioned so that the top of the head and the bun are nearer to “RIA DEI GRA” The hair is bound with a double ribbon, and gathered behind in a kont with a long loose curl hanging down. The engraver’s initials W.W. (William Wyon) are raised, and are located below the neck. The legend which reads “VICTORIA DEI GRATIA:” almost encircles the bust The legend is an abbreviated translation of “Victoria by the Grace of God” The date is below the bust in numerals. The border consists of teeth, and the teeth sit inside a narrow raised rim. Victoria’s head and neck undraped facing left. The hair is bound with a double ribbon, and gathered behind in a kont with a long loose curl hanging down. The engraver’s initials W.W. (William Wyon) are incuse, and are located below the neck. 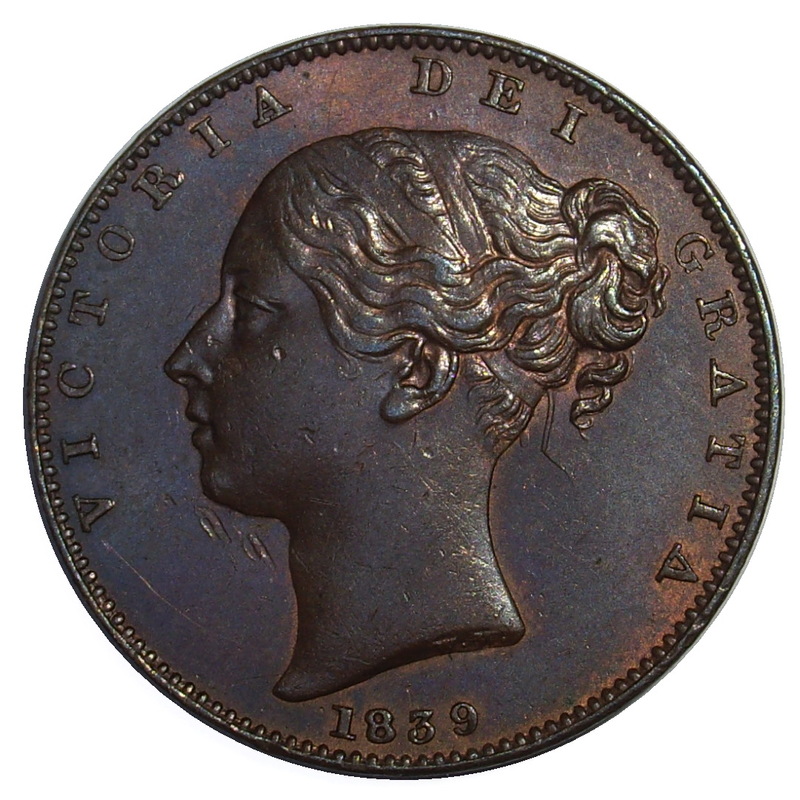 The legend which reads “VICTORIA DEI GRATIA:” almost encircles the bust The legend is an abbreviated translation of “Victoria by the Grace of God” The date is below the bust in numerals. The border consists of teeth, and the teeth sit inside a narrow raised rim. Britannia seated facing right, with long flowing robes and scaled breastplate, wearing a plumed helmet. 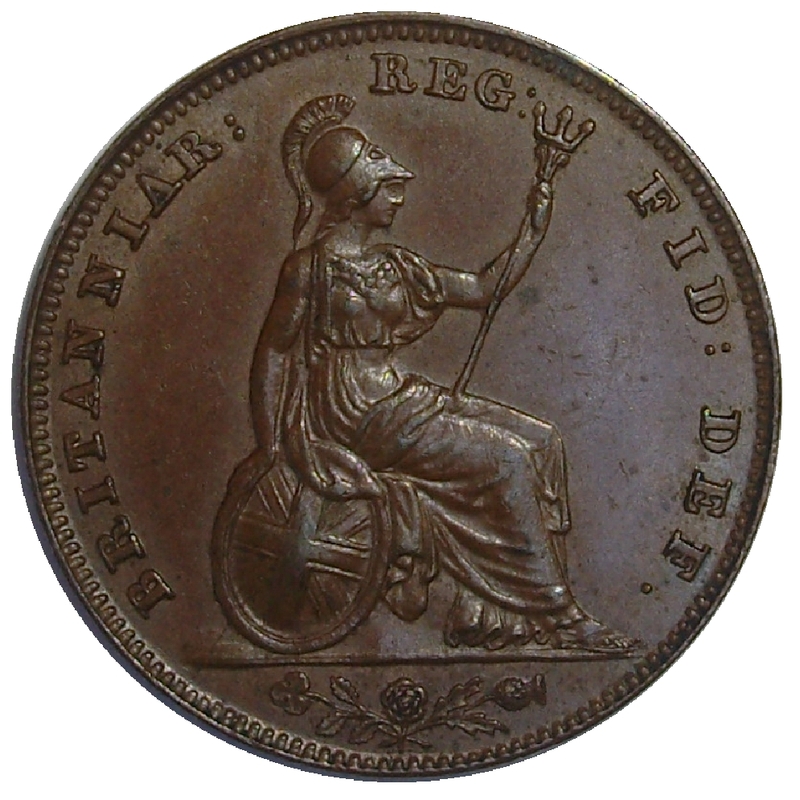 In her raised left hand is a trident, and her right hand rests on an oval shield bearing the crosses of the Union Flag. 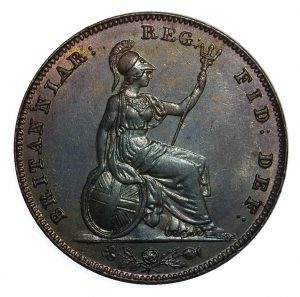 The legend which reads “BRITANNIAR: REG: FID: DEF:” almost encircles the bust. The legend is an abbreviated translation of “Queen of all the Britains, Defender of the Faith” In exergue is a rose, shamrock and thistle with their stems crossed. The border consists of teeth, and the teeth sit inside a narrow raised rim. Reworked design as Reverse A, Britannia seated facing right, with long flowing robes and scaled breastplate, wearing a plumed helmet. In her raised left hand is a trident, and her right hand rests on an oval shield bearing the crosses of the Union Flag. The legend which reads “BRITANNIAR: REG: FID: DEF:” almost encircles the bust. The legend is an abbreviated translation of “Queen of all the Britains, Defender of the Faith” In exergue is a rose, shamrock and thistle with their stems crossed. The border consists of teeth, and the teeth sit inside a narrow raised rim.